The amount of water we have been using is crazy! The average PERSON uses about 80-100 gallons of water each day! Imagine a family of four, that would be 120-400 gallons a day. For everyday tasks such as taking a shower you use 2-2.5 gallons a minute, old shower heads used 4 gallons per minute. Just to wash your face on a hot day or when you don't feel good, you use 1 gallon of water. Think of how much water this adds up to. 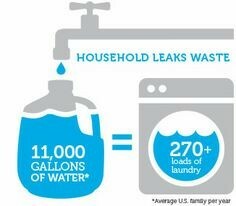 We use so much water for the everyday tasks, think about how we could save this. For more information on how much water we use look down below. Bath: A full tub is about 36 gallons. Shower: 2-2.5 gallons per minute. Old shower heads use as much as 4 gallons per minute. 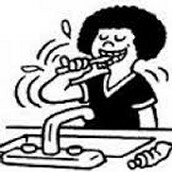 Teeth brushing: <1 gallon, especially if water is turned off while brushing. Newer bath faucets use about 1 gallon per minute, whereas older models use over 2 gallons. Dishwashing by hand: 4 gallons/minute for old faucets.. Newer kitchen faucets use about 1-2 gallons per minutes. Clothes washer: 25 gallons/load for newer washers. Older models use about 40 gallons per load. Toilet flush: 3 gallons for older models. Most all new toilets use 1.2-1.6 gallons per flush. 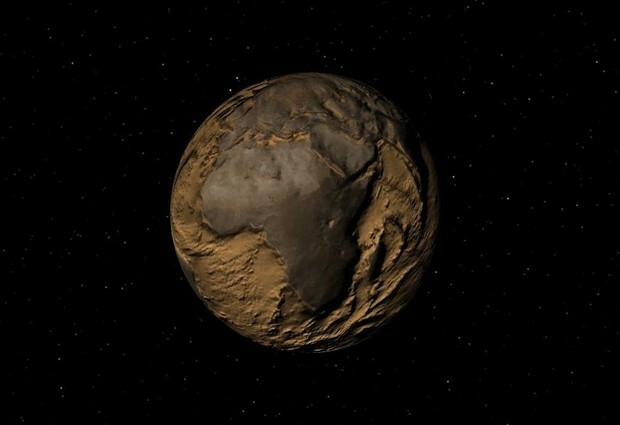 What will happen to the earth if there is no more water? Water can affect you no matter where you are in the world. Even though the earth is 70% water we still don't have enough clean water to drink. Millions of people die from water being un-sanitized. We usually build dams to conserve water but there are still problems with this. Water can be evaporated and that could be most of the water contained. The biggest problem with water being wasted is the amount of people in the world. Because we are losing water this could leave us without crops because we can't water them, so now we not only don't have water we also don't have food. There are many things we can do to save water. Report broken pipes, leaky hydrants and errant sprinklers to property owners or your local water provider. When you want to cool off, use the sprinkler in an area where your lawn needs it most. While brushing your teeth you can turn the water off. 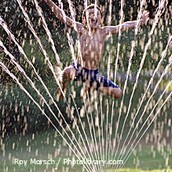 Don't waste water for fun things, even if it feels good. Fresh water is naturally occurring water on the Earth's surface in ice sheets, ice caps, glaciers, icebergs, bogs, ponds, lakes, rivers and streams, and underground as groundwater in aquifers and underground streams. Fresh water is generally characterized by having low concentrations of dissolved salts and other total dissolved solids. The term specifically excludes seawater and brackish water although it does include mineral-rich waters such as chalybeate springs. The term "sweet water" has been used to describe fresh water in contrast to salt water. The term fresh water does not have the same meaning as potable water. Much surface fresh water and some groundwater are unsuitable for drinking without some form of purification because of the presence of chemical or biological contaminants. The global distribution of freshwater resources varies greatly from region to region. An 'inventory' of Earth's waters shows that approximately 97% of the global water supply is found in the oceans, which are saline. A very small amount of salty water is also located in saline lakes (e.g., the Caspian Sea). The remaining water inventory (3%) is 'freshwater'. 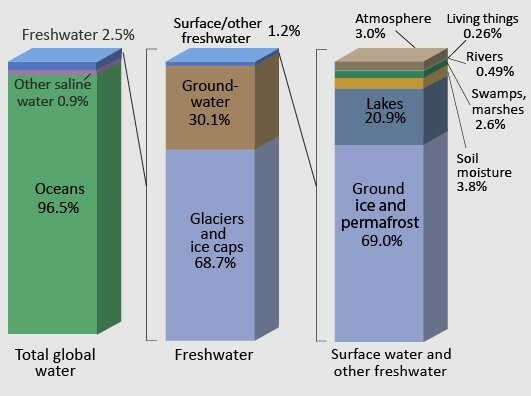 Permanent ice (e.g., continental and mountain glaciers) is the largest freshwater storage on Earth, accounting for about 2% of the total global supply - or nearly 69% of the total freshwater supply. Freshwater is also found beneath the Earth's surface as groundwater (approximately 30% of the total freshwater supply) and in surface water storages such as lakes, streams, swamps and marshes. Minute amounts of freshwater are also stored in the soil, the atmosphere and in biological organisms.